This year, thanks to the boost of the 3D printing trend, we’re launching a new campaign tailored to reward you for the effort of walking the extra mile. What is the MoneyBack Reward about? 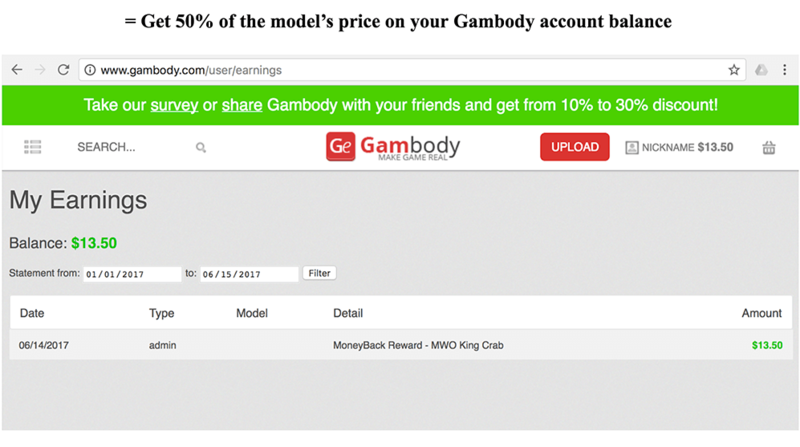 It is a MoneyBack Reward campaign, allowing you to redeem 50% of the model’s price* and get it to your Gambody account balance. *50% of the model’s price you purchased and posted a picture of showing it in 3D printing form. The #Gambody3DPrints hashtag will help us understand that you’re taking the campaign seriously. 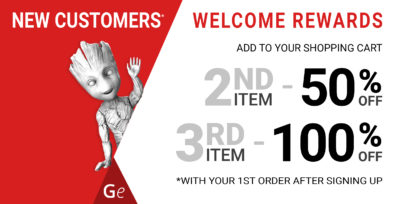 We’ll see your post on our Facebook Group wall and we’ll return half of the model’s price* to your Gambody account balance. Next time, when you decide to buy another 3D model’s files, you can use the credit from your account to pay for it, even if it only partially covers the model’s price you want to buy. 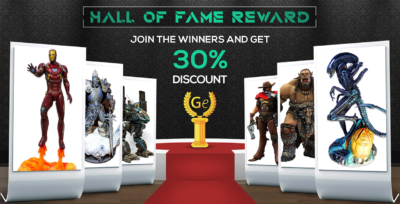 What do you need to do to earn the MoneyBack Reward? 3D print a model purchased on our website. There’s a wide range of video game characters, vehicles, bipedal robots, and more you can choose from. Clean the camera’s lens. And click!!! Take a pic! 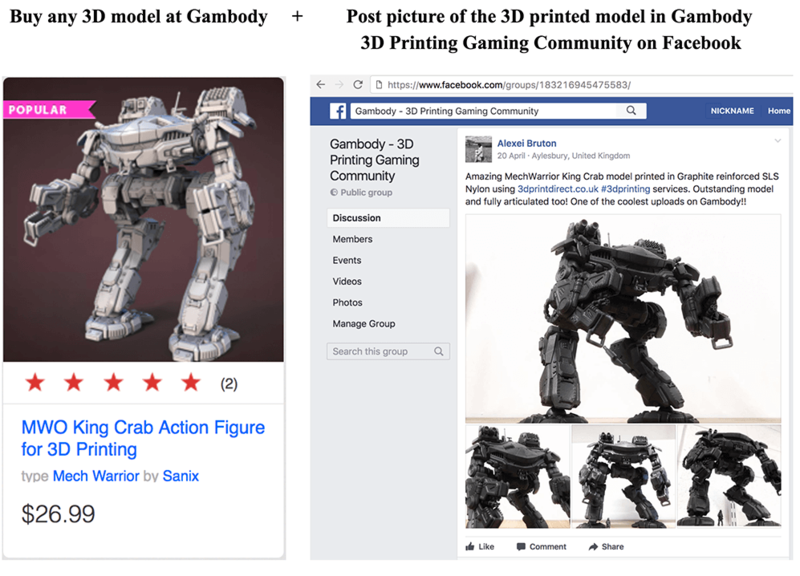 Post the picture you’ve just taken with your phone or camera device on the wall of our Facebook Group with the hashtag #Gambody3DPrints. Don’t forget to share the post on your own Facebook wall and to encourage your friends to do the same. There’s a double win in this for you. 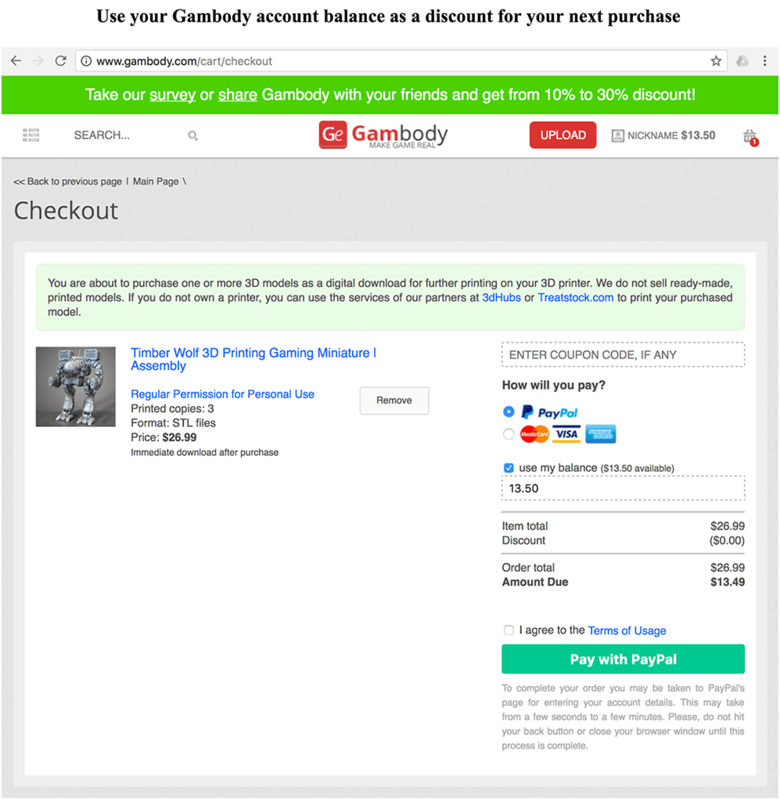 With the new option, you can use both your account balance and a promo discount code to make a purchase. Enter the code in the appropriate field and check the box to use the account balance. The system will automatically calculate the price you have to pay and will display it as the amount due. 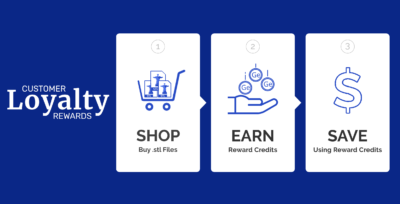 To be eligible for the MoneyBack Reward**, you need to fulfill all the requirements described above. 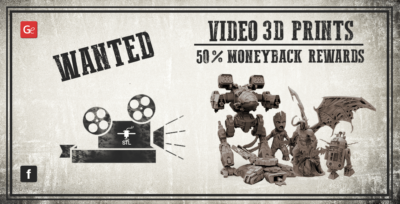 **MoneyBack Reward is not due in case you post a picture of a printed 3D model the STL files of which are purchased with your account balance credited under the MoneyBack Reward campaign. Happy printing everyone! See you on Facebook!